pressing the “Messages“ link above. Allow It to Be Easy, is now in its second printing! 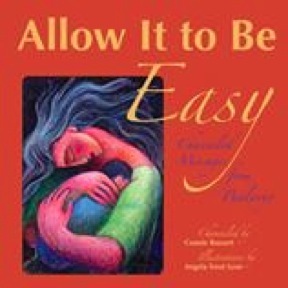 “Allow It to Be Easy” provides easy steps you can take to heal long-held subconscious limiting beliefs and emerge into a peaceful life reflecting your authentic Soul Truths. * Experience loving, gentle, graceful healing. I am proud and pleased to have teamed with internationally acclaimed artist, Angela Treat Lyon, to share some absolutely stunning images which accompany Paularyo’s healing messages. Allow It to Be Easy,is in it’s second printing and is available for purchase HERE. You’ll find the paperback version as well as the Kindle edition of Easy. ALL the reviews of the book are HERE. My first book, Channeled Messages from a Parallel Universe, contains profound channeled wisdom and divine guidance directly from Spirit, as well as my personal notes about my journey as a channeler. I begin this book with a short story about how I discovered my gift for channeling. It was a gift which changed my life direction forever more. From that moment on I explored my new metaphysical side with a passion and over time, left not only my `reluctant channeler’ stage far behind, but also my day job as a college counselor with Deaf students. While channeling my seven Master Guides, collectively known as Paularyo, I transmit their enlightening messages of wisdom and truth. Now you can learn to contact your own Spirit Guides too! The aim of this book is to assist you with enhancing your emotional, mental, spiritual and physical well being. While connecting to your Spirit Guides, you can tap into your intuition and uncover your true self and your life purpose. You also learn how the process of journaling helps you take the path `less traveled’ and see the world through the eyes of your Soul. “I love your book. I have just had a very pleasant afternoon absorbing Paularyo’s healing words. It’s amazing how the different aspects of Source have different feels to them. Channeled Messages is available for purchase HERE . You’ll find the Paperback version as well as the Kindle edition of Channeled Messages. You’re invited to read and absorb some of Paularyo’s Channeled Messages posted on this site by pressing the “Messages“ link above. Thanks for visiting. If you’d like to learn more about channeling, you’ll find lots of information on my sites, Spirit Channeling and Deaf /ASL Spirit Channeling. If you have a question and would like to contact me, please fill out the form below. I will get back to you as soon as I can.